Here's a new meme I think I'll enjoy! 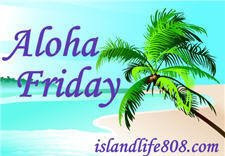 I'm going to answer SEVERAL people's questions though b/c there are a couple "Aloha Fridays" in my reader! Today’s question is: What is your dream job?" My dream job is to be a stay at home mommy! I don't want to have to work for ever. So, here's my question this week:Do you have a nickname? Maybe it followed you all the way from childhood or maybe it's something new, but if you have one, share it! Yea, I have nicknames. Let's see as a child, I was called "Stevie". My family (not my sisters but my aunts, uncles, and cousins), my older adult friends (like my across the street neighbors, and people who've known me since I was little), and Ms. Moose at work all call me Stevie. My husband has never called me Stevie. I call MYSELF Stevie! That's REALLY who I am. Tim calls me "My Lady" or "Miss Ninnie". There's no story to My Lady, but Miss Ninnie developed when we were first dating, and he would mis-spell my name in his e-mails: Stephaninie or Stephaninnie. So, we shortened it to Ninnie (pronounced Knee-Knee) and it stuck. Melanie calls me "Willis" or "Stim". I have no idea where Willis is from, other than it's fun, cuz I call her Willis too! "Stim" is the first two lets of my name & the last two of Tim's & it's what she uses on her blog when she's referring to both of us. And finally, the question from Bridgette at the "Not-So-Blog, Blog". This week's question: If your blog could have a mascot, what would it be? I'd have to say, my blog's mascot would be a purple teddy bear, dressed up like a teacher. Tim gave me a Build A Bear once for a birthday & he sits over looking my computer. He could be my bloggy mascot! Awesome, now it's my turn! What is your favorite thing to eat "out of season"? Mine is snow cones. I LOVE LOVE LOVE Chocolate & Marshmallow Fluff sno cones. I eat them year round! It seems like I've been eating them a lot lately because they are a comfort food. I love your nicknames and they have cute stories behind them! Now your question...I like eating peppermint ice cream all year round! Most brands only sell it during Christmas season but I found that Meijer grocery stores sell it in their own store brand ice cream and it's delicious! I love it! watermelon! I can eat it anytime anywhere! I pay the outragous prices in the winter to get it! Christmas cookies! I also like sweet potatoes all year. Hmmm and I can go for Christmas tea all year. There really is no wrong time of year for ice cream. Granted with the subzero temperatures I am not going out to buy any. I love a hot fudge sundae any time of the year.